A project awarded to Tonka Water was featured in the March 2014 issue of North Dakota Water magazine. The project, to be constructed in Dickinson, ND, will feature a UF Membrane filtration system, and will produce 18 million gallons per day. Read the full article after the jump! 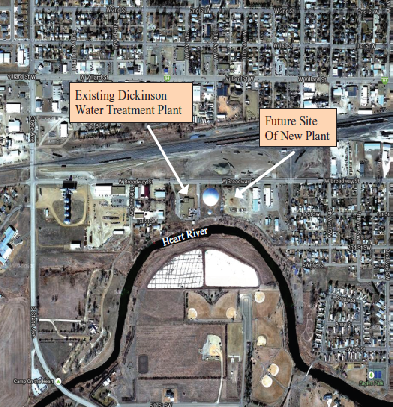 At its Feb. 27 conference call meeting, the North Dakota State Water Commission approved the award of a contract for the membrane system for Dickinson’s new 6 million gallon per day water treatment plant. The contract was awarded to Tonka Water of Plymouth, Minn., for about $2 million. The contract will consist of providing ultra-filtration membrane equipment for removing suspended solids from the water. To meet the anticipated water demands due to projected population growth in southwest North Dakota associated with the rapidly growing oil industry, it was determined that the Dickinson Water Treatment Plant (WTP) required immediate expansion. Because of the ongoing population growth, it is estimated that the required capacity out of Dickinson’s WTP will need to be 18 million gallons per day. The existing Dickinson WTP only has a capacity of 12 million gallons per day. The new 6 million gallon per day plant will be built just east of the existing WTP. The site for the new plant is sufficiently large enough to support future expansion to approximately three times the size of the initial 6 million gallon per day plant. Future phased expansions up to the necessary 18 million gallons per day could then be accomplished as the existing plant gets retired in phases. In addition to the capacity issues with the existing plant, there are portions of Dickinson’s plant that are more than 60 years of age. The new WTP will employ ozonation of the raw water coming into the plant, which combats taste and odor issues. This process will then be followed by lime softening and the membrane filtration. The new WTP will be part of the Southwest Pipeline Project, which is owned by the state of North Dakota and operated by the Southwest Water Authority. It is anticipated that ownership of the existing Dickinson WTP (which is currently operated by the Authority) will be transferred to the state in the near future. Membrane water treatment systems can vary greatly in a number of ways, including, but not limited to size, configuration, and maintenance requirements. Because of this, the final design of the WTP will be dependent upon the specific design of the membrane system that was approved under this contract. Once the specifics of the membrane system are ironed out, the overall design of the new WTP will be able to move forward. Article courtesy of the North Dakota Water Education Foundation.